Got dot stickers? 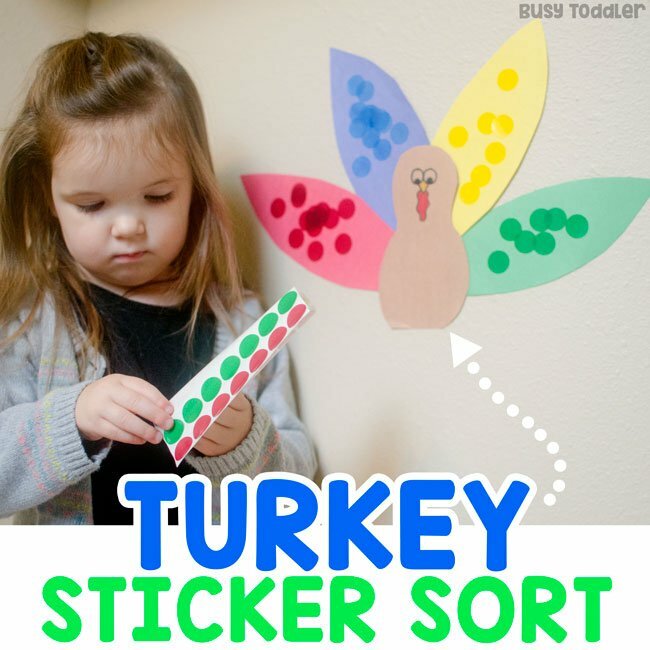 Make a turkey sticker sort activity. Holidays and activities are starting to go together at my house – it’s the newest peas and carrots for us. Easy activities are one of the best way to introduce, explain, and help immerse my kids in holiday traditions. 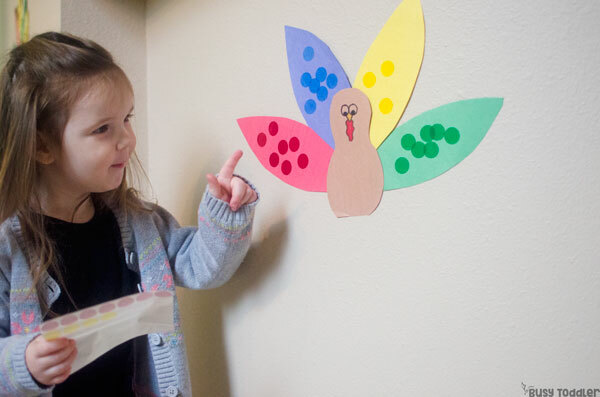 The latest: this turkey sticker sort activity for Thanksgiving. Looking for Thanksgiving activities? 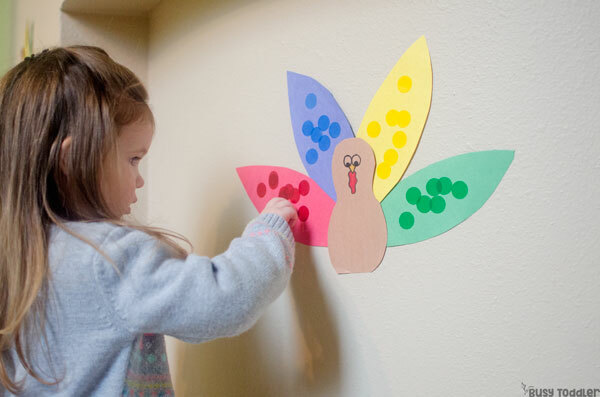 Check out this list of 30+ easy Thanksgiving activities for toddlers. Get your dot stickers ready. Dot stickers are such versatile little activity supply – we can’t have too many. We are so obsessed with them, from shapes to numbers to making a board game: trust me, you can’t have enough dot stickers. Here’s my dot stickers tip: remove the inner white part of the sticker sheet. This makes it so much easier for little toddler fingers to pick the stickers off. What an easy set up! I grabbed some construction paper and made a quick turkey body then four feathers to match the colors of the dot stickers. My 2.5 year old is an old pro at dot sticker activities and she knew exactly what was going on here. She needed to sort her stickers onto the turkey. She took her sheet and carefully began removing the stickers – and before I knew it she was on her third sheet and had been hard at work for 15 minutes. 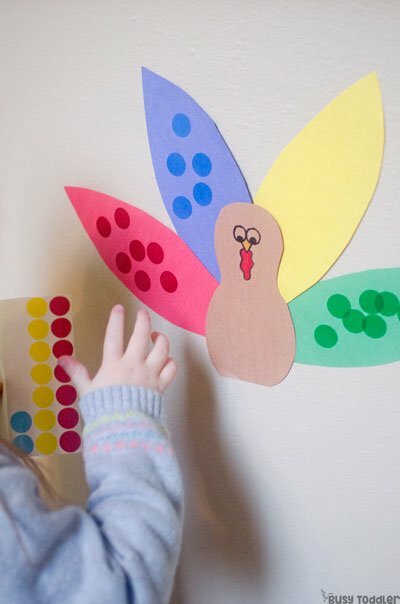 Turkey sticker sort was such an easy activity to set up – but my daughter is working on so many skills while she’s playing this. Sorting is the main skill she’s working on here, and sorting is so powerful. When a toddler is sorting, they’re making decisions, analyzing data, and grouping by attributes. It’s so much more than something simple. While my daughter worked, we talked about the upcoming holiday. What is Thanksgiving? What happens on this holiday? What should she expect? She doesn’t remember much of last year’s Thanksgiving so these conversations are super important. 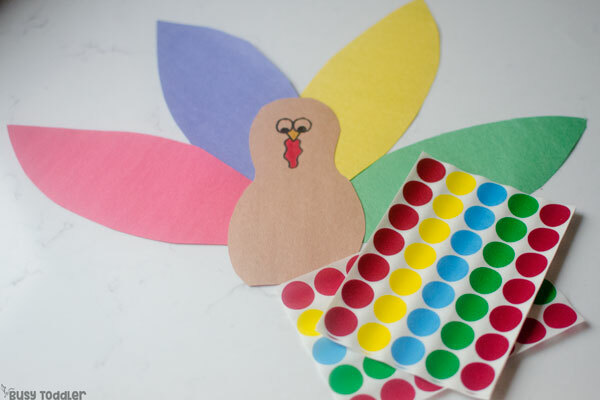 Activities are a great way to introduce holidays to toddlers, and this easy turkey sticker sort was perfect for us. Plus it was an excuse to play with dot stickers and we never miss a chance to use those. 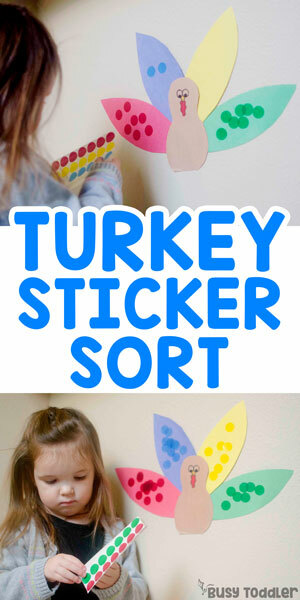 Make a turkey sticker sort with your toddler!